You forgot to do your daily meditation, breaking your 87-day streak on your meditation app and missing out on all the banners and badges that you’re rewarded with for vigilant practice…not to mention the bragging rights that come with sharing your status on social media. Is there any going back in time, you wonder? Well, the better question to ask is, What’s wrong with this picture? Reminder: Meditation is supposed to make you calmer, and stressing out about missing a session or becoming competitive about your practice defeats the entire purpose. Yet that’s exactly what’s happening as meditation becomes more of a competitive sport than, well, meditation. Guided muscle relaxation. Guided, or progressive, muscle relaxation involves tightening and relaxing various muscle groups in an organized way, usually from the top of your head all the way down to your toes. You allow your mind to focus on one body part at a time, tightening and then relaxing it. This practice can be combined with guided imagery and breathing exercises for even more relaxation benefits. Self-massage. Touch can be extremely healing, and you don’t have to spend a ton of money on massages either. With self-massage, you can soothe tense, tight muscles in your hands, feet or head even in the middle of a rough day. You can use your hands or a tool such a foam roller. Yoga. This popular mind-body practice can help reduce stress and pain and improve sleep, among other benefits such as flexibility and balance. There are many varieties (“schools”) of yoga including Ashtanga, Bikram, Kundalini, Iyengar and Vini. Each emphasizes postures that stretch muscle groups along with breathing. You can learn by taking a class or watching a YouTube video. Tai chi. This ancient Chinese martial art is marked by slow, gentle and flowing movements. It’s been described as ‘meditation in motion.’ It can be an excellent workout for the body and the mind. Reiki. This technique from Japan is about channeling your body’s healing energy. A practitioner places his or her hands lightly on or just above your body to help remove anything blocking the free flow of energy, leaving you feeling calm, clear, relaxed and grounded. It is possible to do it yourself, but Reiki benefits are more pronounced when you work with a Reiki master. Proper breathing. Stress takes our breath away, literally. As a result, there is not enough oxygen flowing to the body and the brain to maintain good health. Taking deep, healing breaths from the abdomen during times of stress can jumpstart your body’s natural relaxation response, reducing heart rate and blood pressure and making sure oxygen gets where it is needed. The best part? It can be done anywhere at any time. Mindfulness. Being present in the moment is harder than it sounds given all of the distractions in your head and outside of it. Being mindful involves grounding yourself by focusing on where you are and what’s going on around you to minimize distractions. It is a type of meditation and a skill that can be easily cultivated over time not only for relaxation, but also to conquer anxiety and negative behaviors such as binge eating. Meditation. Stressing about not breaking your meditation streak is self-defeating, but there are still pronounced benefits to the practice of meditation. There is no one right way to meditate. The key is to find a style that works well for you. Essentially, the differences among the various techniques are what you focus on instead of focusing on negative thoughts. 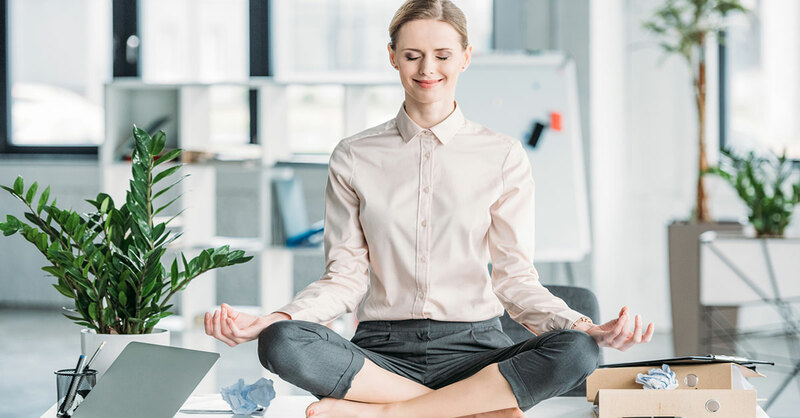 Transcendental meditation is best done after training by a certified teacher but is well-proven scientifically to have many psychological and physical benefits. You learn to sit comfortably and close your eyes for 20 minutes, twice a day, while repeating a personalized mantra. Aromatherapy. The right aroma can have a powerful effect on your mood. Aromatherapy, in which you inhale essential oils by dispersing them in the air with a diffuser or after applying a lotion, can be helpful on its own or when used with other relaxation techniques such as self-massage. Just be careful to use these powerful scents carefully.